Toddler (Sizes 2-4) - £32.99 Small (Sizes 4-6) - £32.99 Only 6 left! Medium (Sizes 8-10) - £24.99 Only 8 left! When Gotham needs a hero, who will step up? Your son has always felt close to superheroes. He likes they way they save people. The awesome costumes they have. He feels for Bruce Wayne's tortured past. He loves the cars, and the weapons. And holy crow, does he love Alfred Pennyworth. Sure, he likes the Marvel movies, and he thinks Iron Man's red armor is awesome, but when you ask him who his favorite superhero is he still replies with, "Batman, duh". Because Batman doesn’t need to be anything other than determined to stop crime. He has no super powers. (Unless you count being super rich a super power.) And he gets hurt all the time, but he still fights the good fight. 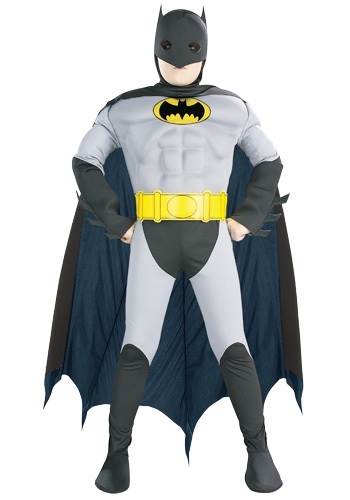 This year get your kid this Batman Costume. Let all the other kids running around be the Hulk, and Superman. Let them shoot arrows at each other as they dress as Hawkeye. He will be trying to avoid the lime light, unlike Tony Stark. He just wants to fight crime, and not be stalked by the paparazzi while he does it. He wants to be the person who steps up to save Gotham, to save people, and stop villains all without the need of superpowers. And let's be honest he is hoping that he gets an Alfred when he puts on the bat suit. Who knows, he may not get his very own butler, but he may get to drive the Batmobile someday. Excellent, worth the price, nearly double the cost of previous ones I've had for my son, but definitely the best. I reckon he'll be thrilled on Christmas morn. I ordered this as my godson needed an outfit aged 3-5 and I couldn't find one anywhere!! All the ages in the uk were 5/7!! I was a bit dubious with it coming from the states but I ordered on the Thursday and it came on the Monday! !